So we finally saw a bit of one of Joe's books on the show! And here it is! -blow to the head. 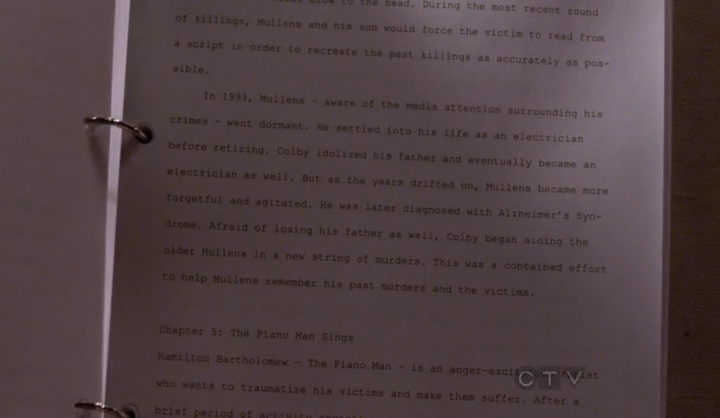 During the most recent round of killings, Mullens and his son would force the victim to read from a script in order to recreate the past killings as accurately as possible. In 1994, Mullens - aware of the media attention surrounding his crimes - went dormant. He settled into his life as an electrician before retiring. Colby idolized his father and eventually became an electrician as well. But as the years drifted on, Mullens became more forgetful and agitated. He was later diagnosed with Alzheimer's Syndrome. 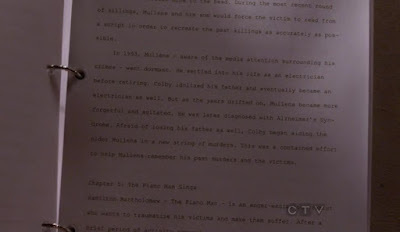 Afraid of losing his father as well, Colby began aiding the older Mullens in a new string of murders. This was a contained effort to help Mullens remember his past murders and the victims. Okay, that wasn't great. Especially because chapter four apparently ends just as the story of the copycat father/son serial killing team was just getting started. Is that all the book is? Brief outlines of the crimes written in super-dry prose? Or is that just a function of the prop having been written up in a rush before the insert was shot? Still, I'm really happy they went to the trouble of doing this, rather than just inserting generic text, but this doesn't read like a true crime book. The first section, about the father/son serial killing team, is disjointed and feels like a bad recap of the episode. Kind of horning in on my territory there, guys. Also, what did you mean by the word contained? I feel like you were using the wrong word there. In any event, I restate my belief that there would absolutely be a market for a book of Joe's reminiscences about the show's cases written in the style of one of John Douglas' books.